Tether your loved ones to your heart by sending this Vibrant Kit Full of Men’s Accessories and surprise them with your special gesture. This Kit is presented with Nike Deo, Parachute After Shower Cream (100 gr. ), 1 Bottle Pantene Conditioner - Total Damage Care (75 ml. ), Pantene Shampoo - Total Damage Care (180 ml. ), Fiama Di Wills Shower Gel - Refreshing Pulse for Men (250 ml. ), One Tube Himalaya Face Wash - Purifying Neem (50 ml. ), 1 Carton Park avenue Deo Soap - Good Morning Freshness (125 gr. ), Use n Through Gillete Presto Razor (2 Pc. 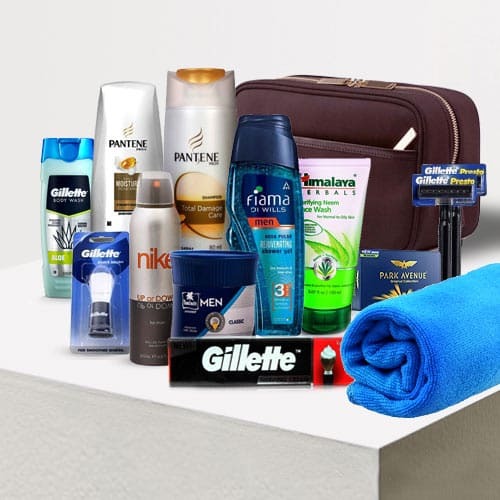 ), Gillete Shaving Cream, Gillete Shaving Brush, Body Scrub, Towel and Travel Kit.